The Islamic State is getting outside help, with plane drops providing ammunition for the terrorist organization, according to an RT Arabic report. Iraqi government soldiers also say this is a recurring theme and the group is as strong as ever. The battle for Iraq’s Anbar Province continues to rage, despite bombing campaigns from the US and their coalition allies. Notwithstanding a big offensive to try and win back territory lost to the so-called Islamic State (IS, formerly ISIS/ISIL) last summer, local Iraqi government soldiers say the militant group is still a potent force. RT Arabic correspondent Ashraf al-Azzawi ventured to one of the key battle grounds in the fight for Anbar – the city of Ramadi, which is the largest settlement in the region and around 110 kilometers west of Iraq’s capital Baghdad. 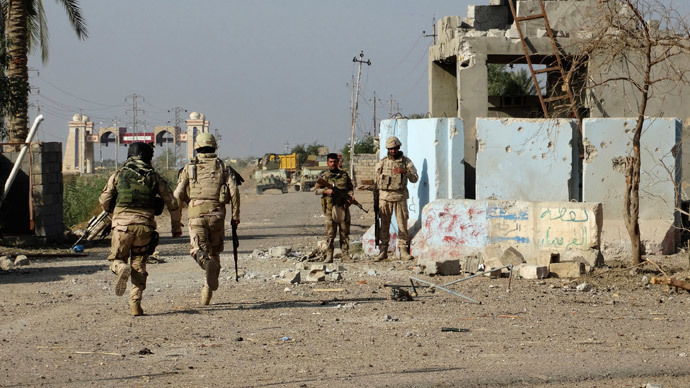 According to the reporter, IS are looking to consolidate their positions in the city and are attacking it with more intensity since Iraqi government forces launched a campaign to capture Tikrit, the birthplace of the country’s former leader Saddam Hussein. Sniper fire and gun fire is constant, as the Iraqi security forces try to make inroads against the terrorist organization. However, things are not going as easily as planned. The pro-government fighters are up against a well-armed foe, who resorts to suicide bombers and car bombs packed with explosives. Even though the conflict has been raging for more than nine months, the Iraqi army confirms the terrorist group isn’t running short of soldiers. On the contrary, they have access to a vast array of modern weapons and explosives, which are reaching them with continuing frequency. “Not long ago we saw three planes, which flew towards this area,” said a soldier loyal to the Iraqi government. “Everyone saw them. One was big and it was flanked by two smaller ones. Boxes were dropped from the plane around 500 meters from the Al-Jarash area of the city. Three hours later, ISIS started attacking us. Our ammunition had finished… there’s hadn’t,” he added. This begs the question of who is supplying the Islamic State with arms. The terrorist group managed to capture a significant amount of weapons as it swept through Syria and Iraq. Saudi Arabia and Qatar have both been rumored to be helping to arm the Islamic State - claims which have been repeatedly denied by Riyadh and Doha. There have been unconfirmed reports from the Iranian news agency FARS that Britain and the US could be behind the ammunition drops. “A group of Iraqi popular forces known as Al-Hashad Al-Shabi shot down a US Army helicopter that was carrying weapons for the ISIL in the western parts of Al-Baqdadi region in Al-Anbar province” in late February, FARS claimed. There also have been unconfirmed reports of US weapons and aid dropped from planes falling into IS hands. An undated video released by the unofficial IS mouthpiece “a3maq news” in October showed a jihadist displaying several boxes of munitions with English-language markings. During the past week, the Islamic State has hit Ramadi with 150 mortar shells and attacked security forces with 23 car bombings, Faleh al-Issawi, the deputy chief of the Anbar provincial council told Bloomberg. He added that the militants have come up with a new tactic of digging kilometer-long tunnels and planting bombs under strategically important buildings, such as the Iraqi army headquarters. The Iraqi security forces are doing their best to stem the tide of the IS onslaught and admit that more military support is needed to take back Anbar. When this will come is anyone’s guess, though there are rumors amongst the soldiers who spoke to RT Arabic that more resistance fighters will be sent there as soon as Tikrit is recaptured.